This morning I received the news that Rod Dibble, pianist at Oakland’s The Alley since 1960, died December 18th, 2017. Rod taught me to sing. Rod taught thousands of people to sing. All the members of the Alley family–he taught us to sing. In the summer of 2012, I talked Rod into sitting down with me for two interviews held at Peet’s Coffee, at Lakeshore, where he got caffeinated for the evening of music to come. I wanted to write a long profile of Rod but never found the right way. I’d like to offer this interview in hopes that Rod’s spirit will live on through his own words. I apologize for my haste in preparation. I’ve left question marks in a few places where I couldn’t make out Rod’s words, and no doubt I’ve left typos, too. Thank you for all you gave to us, Rod. You gave us singing. Your spirit will always be with us. ROD: I draw the shy people in. First thing I do is automatically listen to the voice to see what key they’re in. Where to put ’em. I move them up and down as they get stronger, too. You want to hear from the beginning? From the beginning. I was born in Pasadena. I came to Berkeley at age 6. My mom was always a waitress. Coffee shops. And my father owned a coffee shop. Dibble’s. In Berkeley. And we were there until BART came through, 1945. We had three dogs and four birds. And I was the dishwasher. I knew all the restaurant terms. I was 12 or 13. Then I waited tables. Before Dad was a technician. He was always in the restaurant business. That’s what he loved to do and he was a good cook, and mom was a good cook. My dad’s from Michigan and mom is from Iowa. I started my musical career when I was seven. My grandmother came up to visit and bought a piano from the lady next door to us. Beautiful old grand piano. Gold plated strings, from Germany. And I took lessons from the landlady in front. I was seven. All the way through my seventh year I took lessons from her. And really didn’t get into the lessons. I liked to pick out stuff on the piano because my mom would sing all day long. She would sing the old Vaudeville songs. My uncle was in Vaudeville. Yeah. She used to tour with him on the Orpheum circuit. So she knew all the old tunes. She would sing and I would pick the tunes out. So the landlady said, you know these lessons aren’t going the way he wants them to. And she said she knew of a bandleader that gave lessons. So I took lessons from Chuck Dutton. He became my mentor and my idol. I loved him. Took with him ? years. Taught me all the chords and how to do the leads. Not classical technique. Just taught me the chords and all the runs and riffs. He’d write down one and say you’re going to love this riff. Or this riff is killer. Oh, god was he wonderful. Got to study with him once a week. In his house off of Telegraph on Prince, his studio. He’d wear a double-breasted suit, a yellow tie and a white carnation. Glasses. And just a boisterous laugh. And I fell in love with him. God, how he could play. You’d go in for a lesson and he’d go into the other room and tell you to do whatever you wanted. He got me jobs playing when I was in my first year in high school. He says Rod, I can’t teach you anymore unless you want an advance degree and all that, you don’t need to. He told you to just get out there and play more. He eventually died, in his fifties when he taught me. So that was the start of my professional career. He’d get me jobs Saturday and Sunday. And all I would do is play background piano at these cocktail parties up in the hills, very nice houses. And Oakland must have been very different then, too. And that was the start of my playing. I used to say just teach me all the boogie-woogie. He’d teach me the five or six different basses and all the runs and riffs. And he finally says OK, now it’s time for you to learn a ballad. He gave me “Deep Purple,” I remember. So that’s what I learned after the Boogie Woogie. What did your parents think of your piano career? My dad never sang, he was always too shy. But my mom sang all the time. And I’d practice and sit there and cry and mom would say now Rodney, take a break and just get away from it for a while. Twin brother. He just passed away. Two years ago. Lung cancer, smoker. He was an artist. And he went to IBM after college, right on the ground floor. In sales. Gave speeches. He was a master of makeup. Theatrical wigs and presentations. He was interested in show business. And they all looked forward to his speeches. Started in Fresno and Bakersfield. Then for a while Oakland. They kept putting him in the far east, Hong Kong. He was living in Charlotte when he died. And his wife is coming to visit in July. Did you get along when you were young? Oh yeah. I loved him. I had an older brother who was killed in a car accident. In 50 maybe, I was still in high school. Just destroyed my mom. My mom was never the same. My parents died in the 70s. Mom and dad would come in to see me in some clubs in Oakland. You went to Berkeley High, right? I once heard your high school friend say you were the nicest guy in high school, too. Is that how you remember yourself? No. I loved high school. But I was doing shows, all the assemblies. I had a five-piece band. And right out of high school was the Korean War and I was drafted. Had asthma. Deferred. Twin brother went. I got a job at Larry Blake’s on Telegraph, playing five nights a week. That was the big restaurant at the time. Very popular. Downstairs. There was sawdust on the floor. an old upright. And all the college kids came in and in those days all the college kids sang along to the old, old songs. Sing along songs. College songs. And I learned on the job, you know. It was ten dollars a night and all the beer I could drink. I’d walk through the campus at two in the morning and think this is the greatest life in the world. It was wonderful. It was wonderful. It was good training. You’ve got to do any key for all the sing-alongs. What do you think you loved about it? Because some people wouldn’t want to do that kind of work. Oh, oh. I loved singers. I just love singers. Because of your mother, do you think? Yeah, I think so. It’s like another musical instrument, if you’ve got a good sense. And people who have a hard time singing, it’s a challenge to make them sound good. If you make them sound good, you make yourself sound good. And if they can barely get through a tune it’s ok, because the reward —when they’ve never done it in public, and the look they get on their face when they get the applause. That’s my reward. That’s, God. I love singers. You have launched so many singers who never would have had the guts. Yeah, yeah. Oh, boy. Also. You learn lyrics. You’ve gotta know the words, so you can jump in and help the singer. You right from the beginning took that as your responsibility. Oh, yeah. Oh. From Larry Blake’s. And then I went to the Tin Angel, on Embarcadero. The folk singer ??? and a banjo player. and it was in an old warehouse. And I was on a stage. and I did an act. We all got together at the end of the sets. Funny songs, novelty songs. And then this the guy that owned the Willows, and the Willows was a road house in Orinda. He had a piano bar and it was white leather. And his wife’s mink coat, he cut into strips, and it was a mink piano bar. I bet his wife didn’t like that. And there was a duo that worked dancing in another part of the building. And I was in a special little room with a mink piano bar. And that’s where I really learned to do piano bar. Twenty-two. Having people sitting around, then I’d encourage them to sing. 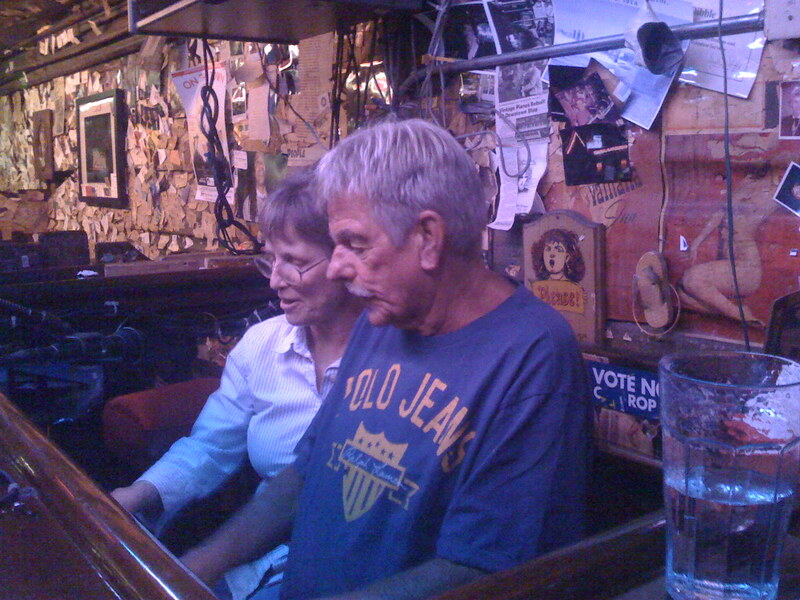 Larry Blake’s, it was just an old piano with people behind. But this was a piano bar. When I was 21 and these people were in their forties and fifties and sixties, they knew more tunes than I did the old songs, and I learned on the job. They didn’t need lyric books. They knew the songs. Oh, I loved it. I loved it. Coat and tie. I lived at home still on Hearst. I could drive to work in twenty minutes. I was there a long time. I went to Contra Costa junior college and I thought, naw, naw. I gotta play. Except I was always jealous of my brother’s education. After the Willows, the mink, I got a booking agent. And a publicity agent. And Lloyd Johnson was my publicity agent. Married to singer called Helen Morgan. He was a writer for the Alameda Times Star so I got all this publicity. A full page. A star is born. And I got a booking agent. And his name is Al Morris. His brother is Tony Martin the actor and singer. I met him in his office and he says, Dibble. He was really Jewish. Dibble. That’s not Jewish, that’s not Italian, he says, what do you want to be in this business for? So he’d get me a job with a contract, two weeks. And he put me on the road. And I worked all the way from Redding down to Southern California. I played in a barn. But I never could build up a following of people because it was just two weeks, and then they’d move you on to another place. All piano bars. Amazing that there were piano bars then, that was what people did. Yeah, there were six on Grand Avenue. Before cable TV. And so, I was on the road. I loved Merced, Fresno. All—Tulare. But I never got a chance to build a following. Performing. You weren’t in the round. Did you like that as much? Did you play jazz mostly or . . .
American Song Book. Yeah, I never played jazz. I never wanted to. Not interested in that kind of music? When I was a kid, I thought, where is music going after the war years, where is music going to go. I thought, it will go into modern jazz. Which lasted a little while, and then rock and roll took over. And I hated rock and roll. I can’t stand the sound of plugged in music, electrical. Is that what bothers you mostly, or is it the songwriting, too? Yeah, then there’s all the lyrics are all baby baby baby baby. All the great lyricists, all of them, they vanished after rock and roll. This isn’t my quote, but the invention of the Fender guitar was the downfall of twentieth century music. I just stuck with the old tunes. I didn’t learn the new ones. And I didn’t need to. I was playing a place called the Palm Gardens on 13th and Harrison. In Oakland. And Jody came there. My boss. And she says, you want a job at The Alley? Because her piano player was sick a lot. His name was Bob Harris and he was wonderful. Oh yeah? What was he like? Oh, same act as I had. How long had he been there? Five years. And accompanied singers and sang himself. He was an old curmudgeon, archaistic, but he he was great on piano. I would sit in with him, do boogie-woogie duets, this was 58. He had cancer, he died. And Jody says to me, how about playing at the Alley? That was 1960. And I’ve been there ever since. When did you first get married? When I was at the Willows. Someone you met at the Willows? Yeah, a Berkeley girl, and we got a little home near Grizzly Peak. but it only lasted a year. It was my fault. I was young. You know, everyone just got young then. I mean, I loved her dearly. It didn’t last. I didn’t have children until my fourth wife. So you had more wives? Linda is number five. Huh. So the first one lasted a year. I met all my wives in the clubs. Yeah, really? They’d all come and sing? Did you only marry women whose voices you like? No, my first wife didn’t sing. Or my third wife, or my second wife didn’t sing. But my fourth wife that I had Molly with, she was a good singer. That’s one of your two children? I had Molly. Margie was her name. Fourth wife. She had a young son who never knew his father. So I adopted him. Sweet guy, I love him. He’s in southern California. So he’s my son. Why do you think you kept marrying? I love women. I thought, well, OK . . .
Next time it will work? What do you think didn’t work for them? Your hours? Yeah, yeah. And two of them broke up with me and two of them I broke up with. But I was married to Margie 12 years. I was onto marijuana. What time was that period? Oh—first it was pills in the fifties. Uppers, and then downers. You were on the club scene, right? Yeah, it was terrible. Then I started drinking. It’s a wonder. I’d drive to work and drive home. So I met Margie and stopped drinking. When I had Molly. So tell me what the Alley was like when you started there. It was the same. The people were older. All my friends, all those people go to bed at 9 or they’re dead. Jody was a real character, right? She had a mean streak in her. But she would be at the Alley at 4 in the afternoon until 4 in the morning. She worked very hard and that was her life. She and Chuck. Chuck is the nephew, and Jackie. They would go to the horse races. We all went to Las Vegas, flew. But it was all work with her. And she drank. She’d kick me out and I’d say I’m sorry. She enjoyed it but she had a mean streak. I’d go to work and say hello and leave and say goodbye. And that worked all those years? She must have really valued you. One summer I grew a mustache on my vacation and she says, it’s either you or that mustache gotta go. And I says, well I’ll go. So for 18 months I was gone. Just around the corner at a place called Vincie’s then. It’s the Heart and Dagger now. 1967. Then she says, OK, you can keep your mustache, come back to work. What was the Alley like compared to the other piano bars at that time? Were you guys one of the best? Were they all competing? 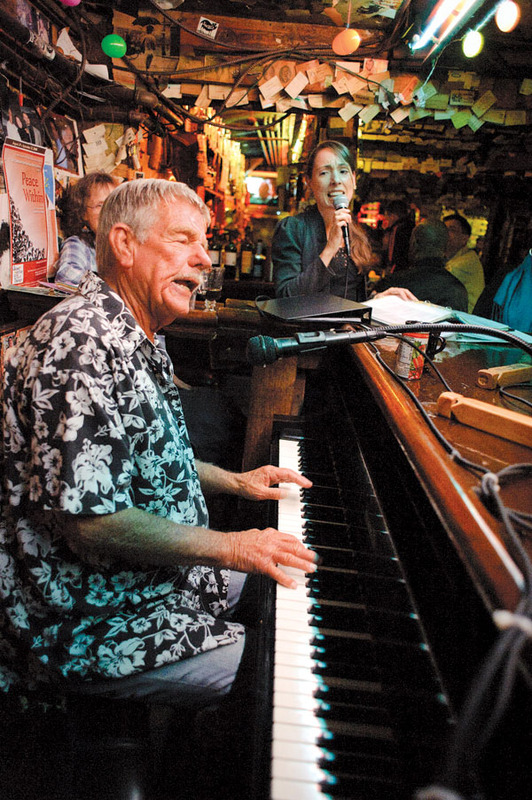 Smitty’s had a piano bar. It was plastic, see-through, you could see the whole workings of the piano, it was kind of neat. And a good friend of mine, Kelly Rand, played there. And then down the street was a place called Chuck Coglan’s, it’s a bicycle shop now on Grand. And, uh, I can’t remember the guy that played there. And then right around the corner was Patty’s. And Patty was a gal just like Jody. Single gal, bad temper, but the two of them competing against each other who could be the worst. And that was a piano bar. And up on Broadway was Omar’s, and that was a piano bar. And they all did the same thing. Microphones. Not all of them passed out music. The people at that time knew the songs. When did they start to go under? In the 80s, would you say? Yeah. That was the death knell. And I hung on. Were you worried when that was happening, that the Alley would go away? No. Chuck said I would always have a job there. Why did he say that to you? Right after Jody died he said, you will always have a job here. I never had to worry. He loved me. So I never had any worries about working at a piano bar. I always had the alley. The other players all passed away, they were all much older than I. And with the passing of that, that’s when music changed also. Nobody does the old songs. Yeah, you go to a piano bar now and it’s 70s and 80s. To me, that’s contemporary music. But I learn a tune a week, and it’s always out of the American Songbook. There’s thousands of great old standards that I have on my list to learn. “It Can’t Be Wrong.” And I’m learning all the verses to three Cole Porter tunes. You’re The Top. Learned the fourth and fifth verse. Arrow Collar and Jimmy Durante in there. I always go back. There’s so many to learn. My days are made up of: First I practice 45 minutes and then I do exercises and then I take my walk and then I practice again. Have an upright at home, really nice. Don’t know the name of it. And of course Linda and I learn tunes together and she misses singing so much. No, it’s past laryngitis. She’s got an appointment. It’s just killing her. Anyway we’d work all day long on some songs. So my day is full. How long were you single between your fourth wife and Linda? Not long. I’d meet somebody and—I love women. It’s good to have your share of romances. From time to time you have to ask people to leave the piano, if they’re being obnoxious. Seems you’re pretty forgiving in the scheme of things. There’s a few I’ve had to have 86’d. For being disruptive. And all they want to hear is their own voice over the microphone. But that’s very few. All I have to do is call whoever’s tending bar and they’ll come over. I’ve never had any trouble getting anyone out. I’m very fortunate. It’s not that kind of place. Who’s the most veteran vet? Dave? Yeah, maybe Dave and Sally. David worked for the Tribune. Married to nice woman. She never came in the club. And she died. 15 years ago. So I said, Dave, come in and sing, it’ll make you feel better. And that’s where he met Sally. Yeah. Oh, yeah. So a few of them work out. Paul Rose, twenty years. He’s a prince. He’s one of my very favorites. And he’s the one I get all my music from, obscure songs. No, I’ll be glad to die at the Alley. I wouldn’t change places with anyone. Oh, God. One night I came to work and there were fire engines all over the street. Guy who lived upstairs I didn’t like. Drove by and said, that couldn’t be the Alley. It was my first scare. I’ve never auditioned for a job. Scary. I would hate to just sit there and play by myself. What if business gets bad? Business has always been good. One time Jody forgot to pay her liquor tax and had to close the place for two weeks. This is great, Rachel. You pried out information that even I never knew. Yes, Rodney’s twin brother was living in Charlotte, North Carolina, when he died. Rod and Linda went to the funeral. I’m flattered that my name found its way into the interview. Besides Dave Chapman, I think Susie Taylor is the only singer still in attendance longer than me. I remember many of the old timers, now moved on or deceased. Rod always remembered all his regulars, their songs, and their keys. The way he set the ambiance and tone of the Alley was amazing. Wonderful. It is so nice to see ask those memories. So sad to hear this. I spent probably too much time in the Alley when I first landed in Oakland. I never worked up the guts to sing, but I was always appreciative of the singers and the atmosphere Rod created. Not everybody was a pro, but everyone was treated like one.